We encourage all employees and artisans to continue exploring their interests and education. We offer either full or partial payment of any continuing education classes to interested individuals (based on income level). We try to provide workers with increased opportunities when possible. For example, we offered to teach the knitters how to operate knitting machines in order to provide both AHA Bolivia and other local businesses with quality machine knit garments. We purchased knitting machines for all those interested and gave classes on the techniques of machine knitting. After learning, all women still interested in incorporating machine knitting into their repertoire were able to slowly pay us back for the machines they kept. In the past we have also provided English classes. 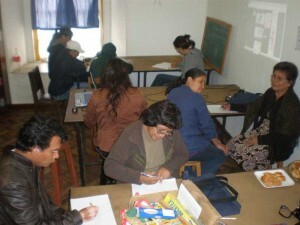 Members of the knitting and leather cooperatives were able to participate in a private 4-day design workshop given by consultants of the World Fair Trade Organization (WFTO) in March 2011. One of the most fun activities we have provided is a whole year of capoeira (Brazilian martial art dancing) classes. All levels of the business from owners to knitters participated with great energy!